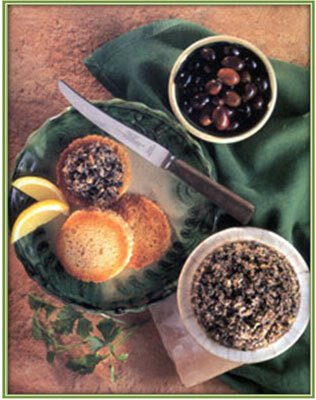 Place the olives, anchovies with their oil and capers into a food processor or blender and chop to a paste. Add the olive oil and lemon juice while the machine is running. Blend to a paste. Taste and season with black pepper. 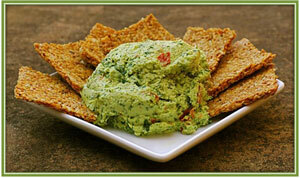 Use as a spread on toasted French bread, pita breads or crackers to serve as a snack with drinks. Spread over a pizza base before adding the topping. Mix into warm pasta, or thin down with a little olive oil and wine vinegar and use as a dressing over potato salad. olives and sun-dried tomatoes to garnishDust chicken pieces with flour. Mix garlic, herbs, salt, vinegar and olive oil together and brush over the chicken. 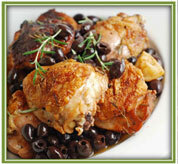 Place the olives, sun-dried tomatoes and bay leaf in an ovenproof dish and arrange the chicken pieces, skin side up, on top. Sprinkle with brown sugar and carefully pour the wine and chicken stock down the side. Bake open at 180ºC (350ºF) for 45 minutes until browned and cooked through. 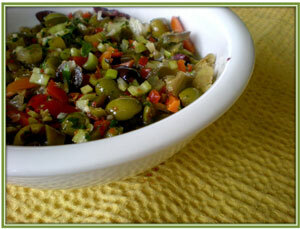 Garnish with extra olives and sun-dried tomatoes and serve with rice, pasta or baked potatoes and a crisp, fresh salad. Put all the ingredients in a blender and process until smooth. Season to taste. Keep in a glass bottle in a cool place. Do not refrigerate. Preheat the oven to 180ºC. Place the spring onions and red onions on a baking tray and drizzle with olive oil. Combine flour, yeast, sugar and salt. Make a well in the middle, add half the tepid water and mix well. down, place it on a floured surface and roll into a large rectangle (about 1 cm thick). Place onto an oiled baking tray. 30 minutes and then bake for about 30 minutes or until nicely browned. 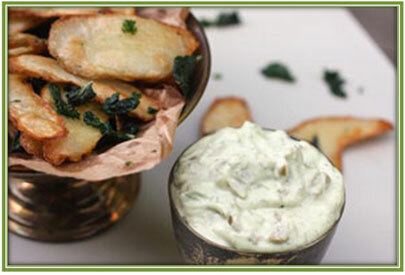 Serve warm as a snack, a starter or with grilled meat. Freshly ground black pepper to seasonProcess the ingredients together until smooth. Season to taste with freshly ground black pepper. 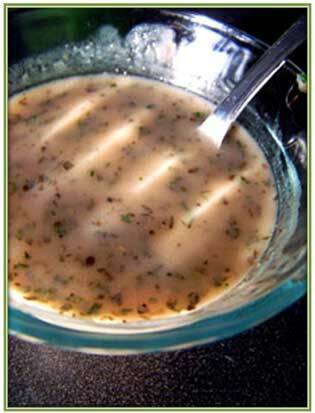 Use as a dressing on potato salad, spread on bread when making sandwiches and use with cold meats. 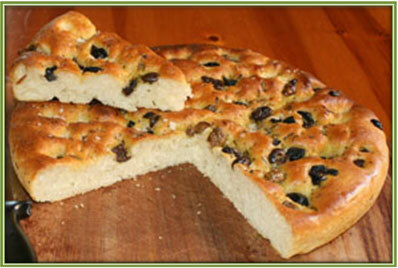 Frozen Olive Oil makes an excellent bread spread, melting rapidly at room temperature. Freeze individual portions of Olive Oil in small butter dishes, ramekins or ice trays and add your own seasoning to serve with fresh bread, salads, grilled fish, meat and pasta. For bread spreads: add garlic, chives, salt, pepper or herbs to taste. For salads: add seasoning as usual and freeze. Serve individual cubes with salad portions. 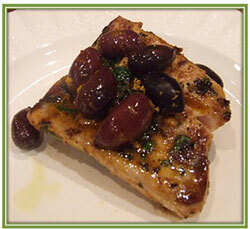 For fish and meat: add a cube of frozen flavoured olive oil as you serve. Whether used to garnish hot or cold dishes, the oil will release a bouquet of flavours as it melts. Pasta: divide the serving into three or more small portions of pasta per plate and place a differently flavoured oil cube on each portion: chopped sun-dried tomato and basil; origanum and garlic; Parmesan cheese and ground black pepper; chilli, cumin and fresh coriander. 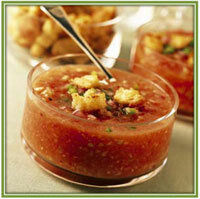 Soak bread in tomato juice for a few minutes then squeeze bread, reserving juice. In a large bowl mix bread, garlic, peppers, cucumber and tomatoes. Puree mixture in batches in a blender or processor to a smooth paste. Stir in the reserved tomato juice. Add vinegar, olive oil and salt and pepper. If the mixture is too thick, thin with cold water. Chill soup for a couple of hours. Add handful of ice cubes before serving (if you wish). Serve with bowls of garnishes. Rinse the Olives briefly under running water and place in a salad bowl. Add all the remaining ingredients and toss to mix well. Cover and chill before serving. Place the beans in a bowl. 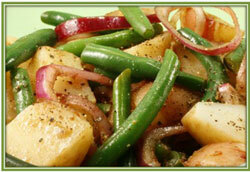 Slice the potatoes and mix lightly with the beans. Sprinkle with the chopped spring onion, olives and parsley. Mix the olive oil, lemon juice and vinegar in a bowl. Add the sugar, salt and freshly ground black pepper. Whisk well and pour over the salad. Wash the broccoli and trim the stalks. Break the floweret’s into fairly large bunches. 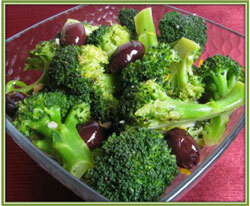 In a large saucepan bring the water to a boil, add salt and broccoli, cover and cook for 10 minutes. Drain the broccoli, reserving the water in which it was cooked. Heat the oil in a large frying pan. Add the garlic and pepper and fry over a low heat for 5 minutes. Add the broccoli and cook for 10 minutes, stirring frequently. Add some of the water in which the broccoli was cooking if the pan gets too dry. Add the olives to the pan and continue to cook for 2 minutes. Turn into a warm serving dish, sprinkle with Parmesan cheese and serve at once. Clean peppers and cut them into strips. Slice brinjals fairly thickly. Julienne carrots. Chop onion into fairly large chunks. Mix the peppers, brinjals, carrots and onion in an oven proof dish. Season and add tomatoes and olives. Toss in olive oil. Sprinkle with grated Mozzarella cheese. Bake at 180°C until ready. If using frozen fish, defrost completely in the fridge before using (no matter what the package says.) Preheat the oven to 220°C. Skin the fish, if fresh, and place in a single layer in a baking dish that fits snugly. Season with a little salt and pepper and drizzle over the lemon juice and olive oil. Scatter the Feta cheese, olives and almonds on top and bake uncovered for about 20 minutes, or until the fish is cooked through. Combine onion, garlic, ginger root, cinnamon, 3T of the coriander, parsley, lemon juice, turmeric and olive oil. 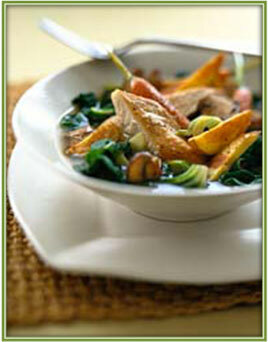 Add 1 cup of water to the mixture and place in a stove-to-oven casserole. 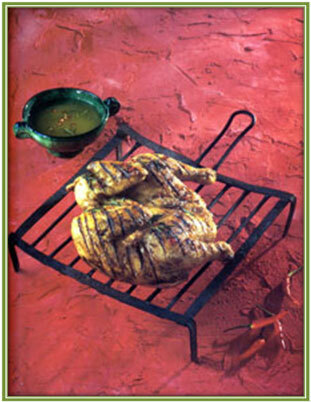 Arrange chicken on top in a single layer and bake at 190°C for about 45 minutes. Remove from the oven and leave for 5 minutes. The dish can be made ahead to this point. If using a preserved lemon, chop finely. If using a fresh lemon, peel, remove pips and quarter and chop the segments. Remove chicken pieces from the sauce. Add olives and lemon to sauce and simmer about 5 minutes until it thickens. Return chicken to the stove, heat through and sprinkle with the remaining chopped coriander. Serve with brown rice.